In this post, we provide a step-by-step plan to write topic sentences for students in Year 9 and 10. You know that you have to write essays for school, but do you still find yourself worried and confused writing them? Do you find yourself getting anxious about getting your topic sentences right? Don’t worry! In this post, we’re going to explain exactly what a topic sentence is and provide the ultimate step-by-step guide for writing them. What is a topic sentence, exactly? A topic sentence is a statement that introduces the argument you will discuss in your paragraph. Topic sentences are basically a one-line summary of your whole paragraph. So, it is very important that you are concise and direct! Topic sentences often require you to focus on one or two aspects of your thesis. You are expected to expand on this idea, refer to the text’s themes, and also signpost the question! Remember, it should NOT be your thesis reworded! The thesis is a BROAD argument for your whole essay, whereas, your topic sentences is just a NARROW focus. Topic sentences must justify your thesis. Before we explain how to write a topic sentence, let’s refresh our memories on our essay and paragraph structures! An essay consists of an introduction, body paragraphs and a conclusion. Your introduction should include a thesis, an introduction to your texts and a preview of your arguments and themes in the texts. Your essay should include 2-4 body paragraphs, depending on your discussion. Each paragraph is a different argument that all work together to justify your thesis. The final part of an essay is the conclusion. This summarises your thesis and arguments and ultimately convince your audience that your thesis is valid. 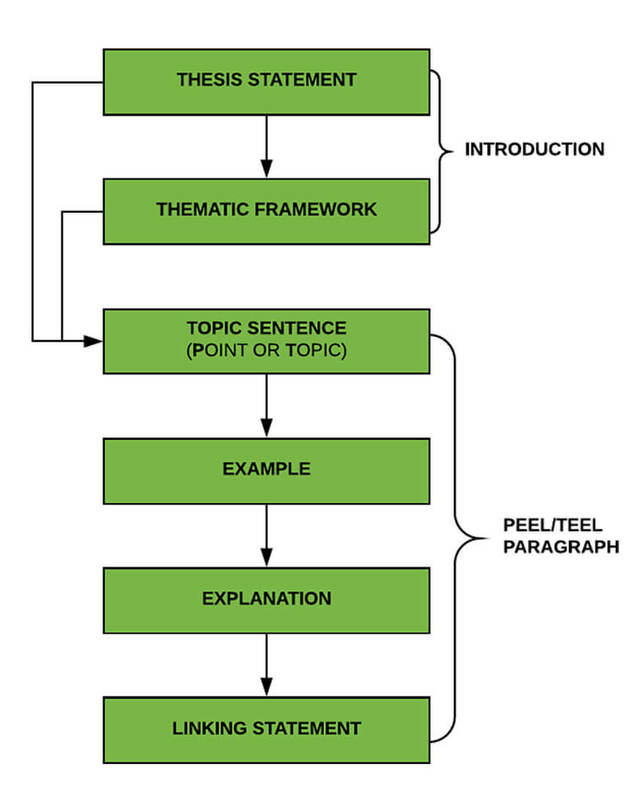 Notice how there are arrows joining the thesis and thematic framework to the topic sentences. It is especially important that you refer to your thesis AND your thematic framework in your topic sentence. There is a very simple approach to write your paragraphs. Sometimes it is called PEEL other times it is called TEEL. Point: The topic you’ll discuss in the paragraph (which is why it also gets called T.E.E.L). Effect: Your explanation of the effect of this technique and how it develops meaning. Topic: The point you’ll discuss in the paragraph (which is why it also gets called T.E.E.L). As you can see they’re pretty similar. We’ll give you a more detailed explanation of how to write a PEEL/TEEL paragraph in our next post. Now that you know the general structure of an essay, it is time to write a topic sentence! Remember, a topic sentence is a one-line summary to your paragraph. It should also include a reference to the thesis and thematic framework! First, we need to look at your thesis. It should be complex enough so that we can pull out different ideas to discuss in a paragraph. Golding explores the conflict between savagery and civilisation to warn his audience of the need to maintain society’s moral frameworks and not succumb to man’s destructive instincts, as it will lead to chaos, violence and disorder. Now, we need to identify different ideas that you can find in the thesis, both explicitly and implicitly. Remember that a topic sentence is not your thesis reworded! 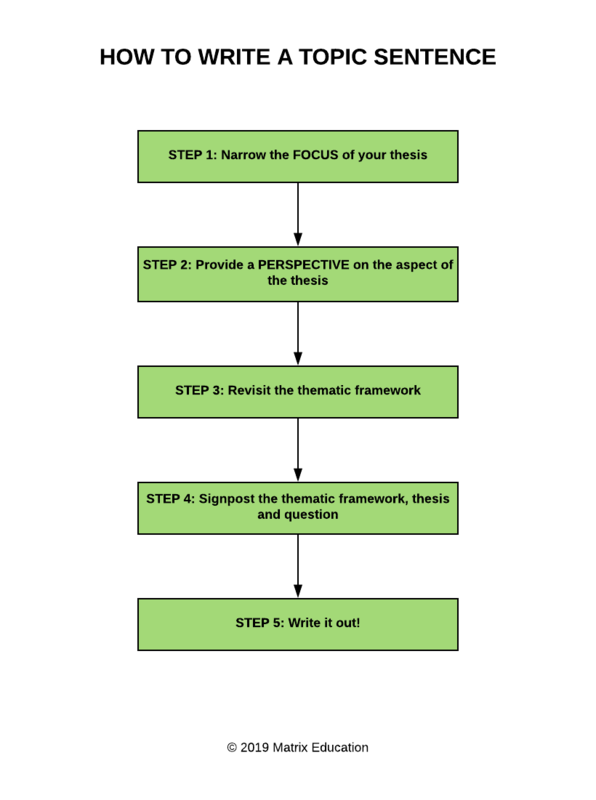 You must pick a key aspect from the thesis, and combine it with an idea from the thematic framework. Think of it as providing a perspective on an aspect of the thesis. This ensures that you add depth to your argument instead of simply restating a part of the thesis. Let’s look at the ideas that we identified from above! Now, we need to make these ideas into arguments. Think of it as basically writing a mini thesis! Savagery and civilisation: Human’s innate selfish desires impede on society’s civilisation as individual’s are willing to sacrifice morality for personal gain. This is seen with the existence of the power dynamic that especially exists in politics; political corruption. Moral frameworks: Moral frameworks set a standard of living that can sustain peace within civilisation. However, once individuals begin to succumb to their personal desires and neglect these frameworks, chaos ensues in society. This is also seen in politics. Man’s destructive instincts: Humans have an innate selfish desire that can drive one to become totally apathetic to those around them. Chaos, violence and disorder: This may be the inevitable product of society. Civilisation is a mask that provides temporary comfort for society and cannot be sustained because humans are innately destructive. You see, each statement expands on an aspect of the thesis by discussing the ideas from the thematic framework. It clearly states the perspective and explains it. This is how you find your argument! Also, notice that these arguments are quite SIMILAR to each other. It’s because they all support the same thesis! But don’t get confused. The statements are NOT the same as each other. Each one has a different focus an edge. Although they generally discuss selfishness, civilisation, chaos and politics, they all expand on them in different ways. Think of an umbrella. The thesis is the umbrella and all the topic sentences all fall under it. 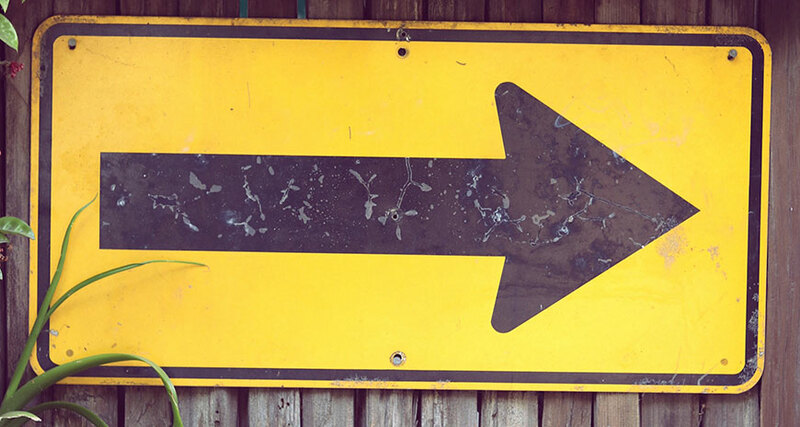 Signposting is when you use clear words or phrases that tell your reader what you are discussing and how you will discuss it. To do this, you need to connect your thesis statement to your topic sentence. This will also ensure that you have a SUSTAINED response. You also need to mention the themes in the text that you will be discussing in your essay. You must use the terms from your question, or synonyms of them, to ensure that you answer it. As an audience, we like to know what we will be reading in a response. So, by signposting your thematic framework, thesis and question, you lay out your response, which makes it easier for readers to follow your argument. This make your response clearer! Now that we have all the ingredients for a topic sentence, let’s write it! Golding’s representation of the conflict between savagery and civilisation highlights how society’s unequal power distribution is a result of one’s ability to sacrifice morality for personal gain. This topic sentence clearly states the argument, refers to the thesis and signposts the thematic framework. Now that you know how to write a topic sentence, let’s go through what you need to remember to include for next time! ✔ Take a STANCE! Turn the idea into an argument by providing a perspective. ✔ Refer to your THEMATIC FRAMEWORK. 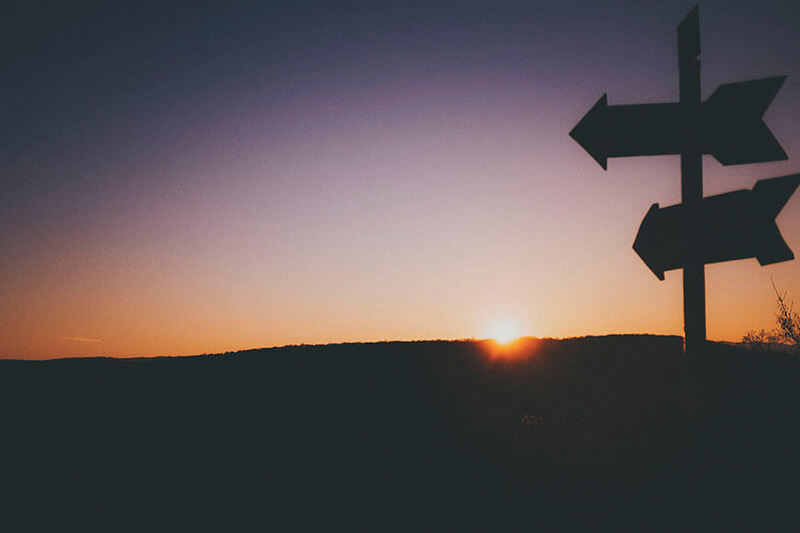 ✔ SIGNPOST your thesis and question. Want to learn how to integrated examples into your paragraphs? Do you struggle including examples and quotations in your analysis? Read this article to learn how to incorporate examples and quotations into your paragraphs to support your arguments and convince your markers.